There are several options available to those searching for vacuum pumps, but how do you go about finding the right industrial vacuum pump for you? Although it’s evident that the use of an industrial vacuum pump is more suitable for larger applications, there can still be a lot of considerations to make when purchasing an industrial vacuum pump for the first time. The market can be an overwhelming one if you’re not sure what elements you should be focusing on when it comes to finding an industrial vacuum pump that’s going to serve you well and ensures that productivity is maximised. Not taking the time out to become familiar with the industrial pump you require could mean that the pump you purchase is not working to its full potential and costing the business more as a result. Fortunately, creating a shortlist is much easier when you have a better understanding of the applications you’re dealing with and the size of these applications. How are Industrial Vacuum Pumps Used? If searching for industrial vacuum pumps for the first time, it’s easy to become overwhelmed. Industrial pumps are used within different industries, including labs, manufacturing and the HVAC industry. The type of pump that is used can differ depending on the sector you operate in. For example, those operating within the industrial HVAC sector will generally use a rotary vane pump, as they are cost-effective and conservative with energy. Similarly, those contending with flood control would need to purchase a propeller pump. Industrial vacuum pumps can be compared to smartphones in that they all offer their own pros and cons, depending on what you’re looking to achieve with the device. Ascertaining what type of industrial pump, you need in the first instance will ensure that you’re able to create a shortlist of the pumps that fit your requirements. When choosing an industrial vacuum pump there are several factors that need to be considered. The very nature of industrial vacuum pumps means that they are more expensive than their domestic counterparts. However, investing in the right system will ensure that your vacuum pump is fit for purpose and is easy to maintain. Engineers that work within the HVAC industry will often be dealing with a lot of toxic materials and will need to ensure that the pump they’re using is fit for purpose. For example, the Vector RD320 is designed for refrigeration applications and is available in an ammonia resistant option. Although using a bigger vacuum pump than required may not be detrimental to the customer, it could mean that the business is paying more than it needs to when operating the pump. As such, it’s important to ensure that research is carried out should any uncertainties arise. The most common way of determining what kind of industrial pump is needed is to work out the CFM (cubic feet per minute.) This is don’t by work out the square root of the tonnage of the application. There can be a significant price difference between the purchasing of a single stage and two stage vacuum pumps, but what do you receive for the additional investment? A single stage pump will only have one vane and rotor, whereas a two-stage pump will have two vanes and two rotors. A two-stage vacuum pump will offer engineers a deeper vacuum level, as the first stage generates the vacuum, with the second stage cleaning the system. This isn’t to say that there is no value in a single stage vacuum pump, but the choice ultimately comes down with what you hope to achieve. If there are some budget constraints, then a single stage vacuum pump can certainly be a worthwhile investment. However, if you’re looking to upgrade your current vacuum pump, or you’re simply looking to achieve quiet operation, a faster process that is more environmentally-friendly, then a two-stage vacuum pump could be for you. Searching for the right industrial vacuum pump will also mean ensuring that you’re choosing a brand you can rely on. It’s easy to dismiss trusted brands as expensive and decide to use an unfamiliar brand with a lower price point. The use of the right vacuum pump could make all the difference as to how much risk both you and your customers are exposed to. There’s nothing wrong in ensuring that the business isn’t spending more than it needs to for tools, but it shouldn’t result in the final product being inferior or dangerous. Ensuring you use a vacuum pump that originates from a trusted brand will ensure that the pump is not only safe but more cost-effective in the long run. 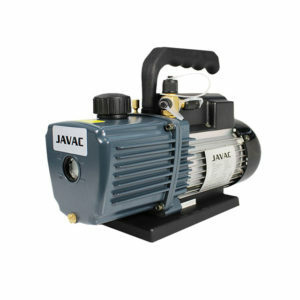 For example, HVAC tools only provides customers with professional industrial vacuum pumps from reputable manufacturers. How Much Should a Vacuum Pump Cost? Although you should never pay more than you need to for a vacuum pump, it’s important not to spend too little either. Even though you may be able to purchase a professional industrial vacuum pump for a lower price, it may not be designed for the task at hand. This could have a series of ramifications, such as reduced productivity and more costs in relation to maintenance. The price you pay for an industrial vacuum pump will depend on the features and design of the pump. Although it would be easy to assume that the more a pump costs, the more suitable it is for the task, this isn’t always the case. Therefore, it’s so important to ensure that all needs and requirements are considered before buying an industrial vacuum pump. If you have a general idea of what kind of pump you need but you’re still looking for some further guidance, then why not discuss your requirements with the company direct? HVAC Tools has several years experienced within the HVAC sector and only supplies vacuum pumps that pass safety standards as well as being built to last. Not only can HVAC tools offer customers a wide choice of vacuum pumps, but it also aids customers who may be trying to balance a budget with an effective vacuum pump. Regardless of whether you have a question or are just unsure of what a vacuum pump can offer, HVAC tools can offer advice in every instance. As well as ensuring that the industrial vacuum pump you use is professional, it can also be a good idea to ensure that there is also a warranty in place. Although ensuring that you use the right type of pump will ensure that you have a tool you can rely on, there’s certainly nothing wrong in purchasing a pump that comes with a warranty. For example, the options available from HVAC tools come complete with a warranty to give customers that additional peace-of-mind that even if anything should go wrong with their product, there are safeguards in place. Although the warranty is unlikely to include any safeguards against improper use, taking some time out to ensure that the pump is being applied to the application in the right way will ensure that you’re not forfeiting your equipment when carrying out work on HVAC appliances.